The new tutorial in action! This week between Softs and Finals has been a busy one as the team began wrapping up loose ends as well as pushed to put final touches on our app. We’ve made a lot of exciting improvements in content as well as interaction polish and our app is almost done. Many new features happened this week as we have been clearing off our backlog. First and foremost, our app has a final name, TuneTrain. We had been considering a variety of names, but playtesters and even some EA folks passing by our work area have really liked the concise alliterativeness of TuneTrain. TuneTrain is official! Up until recently, only levels that had been written in the key of C were able to be played, but, now, all ten of our levels have been successfully implemented. 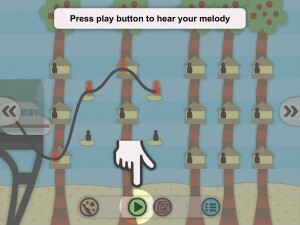 TuneTrain now has levels in various keys and of musical flavors (some happy and some a bit more eerie). We have also tweaked the levels for appearance and flow by changing some note placement as well as by adjusting horizontal spacing for notes that occur very close together. Further polish this week included: adding a parallax effect to the background of our levels; adding sounds to our menus; as well as creating a symbol/button for the accompaniment style-changing UI. The other most exciting thing that happened this week was the successful implementation of the tutorial framework. We now have a basic tutorial that isolates and guides players through specific UI elements and interactions, and we can add/remove steps as needed. Most amazingly, the code merged with our main branch in Git with no conflicts. It was a good week for development. Last weekend, Nathan tested our app with CMU design alumni as well as students at the San Francisco Conservatory, and this week, we also had two playtests scheduled with families. These last few opportunities for feedback before finals have been very helpful for refining our interactions just a bit more. 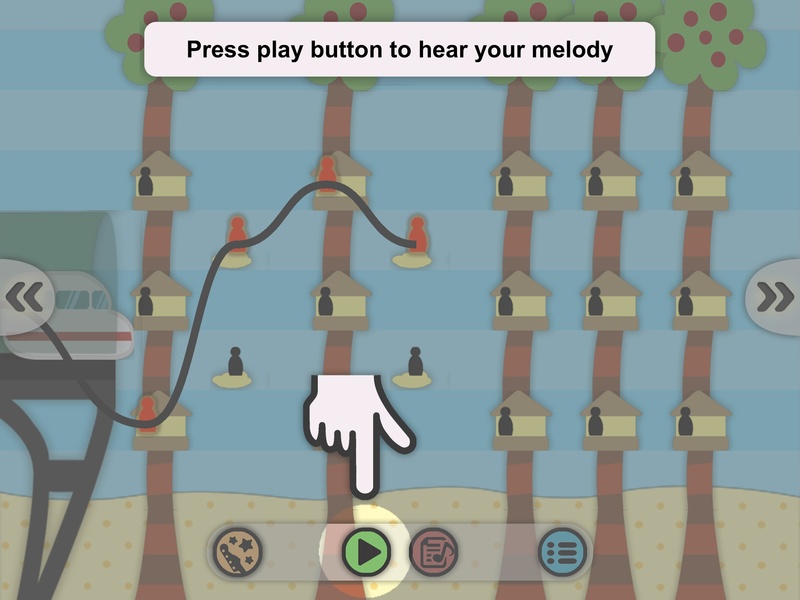 Level scrolling had been changed from a two-finger gesture to scroll buttons in response to softs. However, feedback over the weekend showed that what people really wanted was one-finger scrolling so we implemented that. The playtests during the week then further helped us balance the variety of functions that now need to react to one-finger gestures, which include placing notes, editing, de-selecting, and scrolling. Next week will be a time to tie up remaining loose ends: Getting TuneTrain ready for the App Store; updating promotional media to reflect the final app; writing post-mortems and archiving our work. Moreover, next week is final presentations, and the team is really excited to share our final results with the ETC alum and EA employees who have been following us throughout the semester.